JNN 19 June 2014 Moscow : Europe risked gas supply disruptions Monday after Russia rejected an eleventh-hour compromise deal with Ukraine and cut its supplies in a feud that has further fractured East-West relations. Ukraine hosted the last-gasp talks hoping to keep an energy shortage from compounding the problems of the new pro-Western leaders as they confront a two-month separatist insurgency threatening the very survival of the ex-Soviet state, AFP reported. But Russia’s state gas giant Gazprom said that it had switched Ukraine to a prepayment system at 0600 GMT – a move that effectively halts all shipments because Kiev has not forwarded any money for future gas deliveries to Moscow. 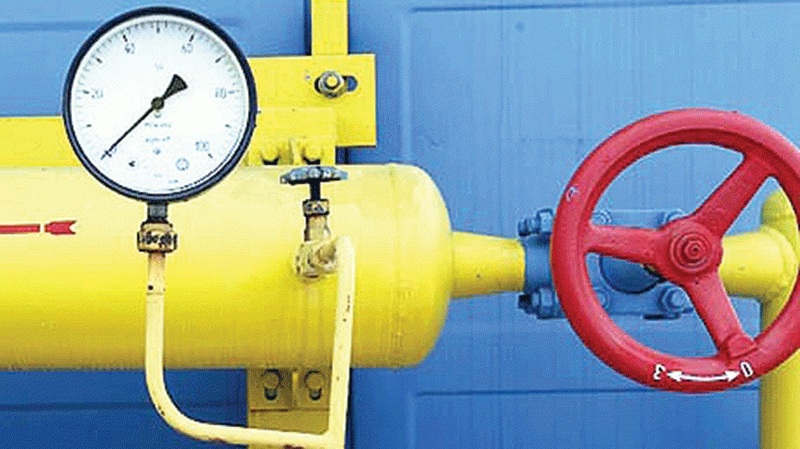 “We have been informed that gas deliveries to Ukraine have been reduced to zero, with only the volumes sent for transit to European states,” Ukrainian Energy Minister Yuriy Prodan told a government meeting. Gazprom said it had notified Europe of possible gas disruption and lodged a $4.5 billion lawsuit against Ukraine with an arbitration court in Stockholm. Ukraine said that it would now try to secure greater gas deliveries from its western European neighbors to make up for the lost Russian supplies. Kiev also lodged a $6.0-billion suit against Gazprom with the same Stockholm court to recover its past “overpayment” for gas. The third “gas war” between Russia and Ukraine since 2006 flared when Moscow nearly doubled its rates in the wake of a deadly winter unrest that pulled Kiev out of the Kremlin’s historic orbit for the first time. Ukraine receives half its gas from Russia and transports 15 percent of the fuel consumed in Europe – a reality that prompted EU Energy Commissioner Guenther Oettinger to urgently step in to try to resolve the feud. The nation of 46 million people had tapped into some Russian shipments destined for Europe to make up for its shortfalls during previous disputes. Oettinger said problems for Europe would probably only begin once Ukraine uses up the gas it had kept in reserve – an amount analysts believe should last for at least three more months. “The next weeks will not be a problem, we will receive our gas volumes,” Oettinger said in Vienna. But he added that Europe “would have a problem with a cold winter” if Ukraine ran out of its storage supplies. Kiev had said it was ready to make a $1.95 billion payment demanded by Moscow if Russia agreed to cut its ongoing rate to $326 from $485.50 for every 1,000 cubic meters of gas. But Putin had insisted that $385 per 1,000 cubic meters was his final offer. The European Commission said that Oettinger had offered a compromise that would see Kiev pay $1 billion Monday and the rest of the debt in instilments stretching through the end of the year. Oettinger also proposed that Ukraine accept the $385 figure demanded by Putin in the winter and see its rate drop to $300 “or a few dollars more” during summer months. “The Ukrainian side was ready to accept this, but for the moment the Russian partners were not,” the European Commission said in a statement. The gas talks were further clouded by a new diplomatic row that exploded after Ukraine’s acting Foreign Minister Andriy Deshchytsya called Putin “a prick” while trying to restrain protesters who attacked Moscow’s embassy compound in Kiev Saturday. Ukraine and the West accuse Russia of supplying rocket launchers and even tanks to the insurgents in a bid to break up its western neighbor following the February ouster of a Kremlin-friendly regime. The embassy protest came in response to the deaths of 49 servicemen killed Saturday when rebels downed a military transport plane with weapons Kiev believes were supplied by Moscow. The minister’s off-the-cuff remark became headline news in Russia and the anger among senior Moscow figures was palpable. Deshchytsya “allowed himself to make comments that cross all lines of decency,” said Russian Foreign Minister Sergei Lavrov. Kiev media are speculating that Deshchytsya’s days as Ukraine’s top diplomat may indeed be numbered because new President Petro Poroshenko intends to name his own close associate to the post in the coming days. Meanwhile, pro-Russian separatists seized the Ukrainian government’s central bank building in the eastern city of Donetsk on Monday. “We have been preparing this for more than a month,” a rebel named Oleksandr Matyushyn told AFP as five separatist gunmen stood guard at its main entrance and bank staff filed out of the building. “We want the tax revenues to stay here instead of going to Kiev,” he added. Donetsk and the neighboring heavily Russified region of Lugansk declared independence from Kiev in disputed May 11 referendums whose legitimacy was rejected by Kiev and decried as a sham by the West. Russian President Vladimir Putin urged Ukraine’s new pro-Western leaders to listen closely to the opinions expressed in the referendums but also refused to recognized the two regions’ independence from Kiev rule. Federal forces’ two-month campaign to regain control over the industrial region of seven million people has now claimed the lives of more than 370 civilians and fighters on both sides. This entry was posted in Europe and tagged Disconnection, Europe, Gas Supply, Russian Gas, Ukraine. Bookmark the permalink.